While the healthtech space gets a lot of attention, with over $8 billion being invested in 2018 alone, there's one aspect of it that is growing quickly but not getting the same headlines: women's health. According to data from CB Insights, the women's health space, which can include everything from fertility tests to period tracking and menopause, is on track to have a record breaking quarter in Q1. Companies that have raised funding include The Pill Club, a provider of mail-order birth control, which raised $51 million; egg freezing service Extend Fertility raised $15 million; and Ritual, a women’s vitamin subscription company, raised $25 million. Adding to the first quarter's total is Babyscripts, a virtual care platform focused on prenatal care; earlier this week, the company announced that it raised a $500,000 round from Inova Health System, bringing its total funding to $14 million. In addition to the investment, the two companies also announced a partnership that will allow Inova to deploy the Babyscripts platform to its employee health plan through Innovation Health, with a plan to eventually offer the service to its entire system. Babyscripts works with healthcare providers, allowing them to get real-time data on their patients, which is collected from connected devices. For example, expectant mothers are provided with a blood pressure cuff, which they can use at home; if any readings are abnormal, the doctor is immediately alerted. If the patient has diabetes, the company also offers a functionality to monitor blood sugar through a glucometer. There also a Babyscripts app that provides patients with education, all of which is controlled by the doctor. Founded in 2013, the company currently works with more than 40 providers across 21 states. Anish Sebastian, CEO and co-founder of Babyscripts, spoke to VatorNews about his company's mission to make pregnancy safer, how the healthcare space has evolved and his ultimate goal with his company. VatorNews: What is the problem that Babyscripts is trying to solve? What is your solution? Anish Sebastian: Our mission is to make better pregnancies available to all women, improving access to and quality of prenatal and postpartum care, particularly for the most socially and economically vulnerable. Babyscripts primarily works with providers – large health systems and private practices – and now payers to increase access to and improve the quality of prenatal care. Our founding premise was to make prenatal care available at any time, at any place through the use of both smartphone apps and remote monitoring experiences. Babyscripts’ remote monitoring experiences increase access to crucial prenatal care by making prenatal care available at any place, at any time through the use of connected medical devices (blood pressure cuffs, weight scales, etc). Babyscripts has shown in controlled studies that it can collect weekly blood pressure and weight data points from more than 85 percent of patients every week through its service. This validated compliance to the program is singular to Babyscripts in the maternity space and allows physicians and care managers to gather necessary and validated data from patients in between prenatal visits from the comfort of the patient’s home in order to detect risk earlier. VN: Who is the typical customer for Babyscripts? Walk me through some typical use cases. AS: Babyscripts works directly with providers of care, including OB/GYN practices, health systems and midwifery clinics, to deliver our solutions to expecting moms. We are also partnering with payer groups and MCOs to help support their pregnant and postpartum members. In a typical use case for a low-risk pregnancy, a provider prescribes Babyscripts to their patient, giving them full access to the educational resources delivered through the platform, including pre-loaded ACOG, CDC, and NIH resources, and any provider-created content they wish to add. The provider then has the option to enroll the patient in any one of six risk-specific modules, like our Schedule Optimization module, a remote monitoring platform designed to optimize the amount of prenatal appointments for low-risk patients. If a patient is enrolled in this module, they receive a Mommy Kit, containing an internet-connected blood pressure cuff, which they use to track their BP levels daily. Babyscripts can detect elevated risk between appointments, and if need be, will alert the provider of abnormal readings, enabling intervention and triage. VN: What kind of ROI have patients seen thanks to Babyscripts? In terms of soft ROI, harder to calculate but just as significant for providers, our solution has delivered significant results. VN: What does it mean to have Inova as an investor? How will your partnership with them work? AS: What we’re most excited about in this investment and partnership is to have another big health system validate our vision for obstetrics. Aligned with their investment, INOVA will deploy the Babyscripts’ solution first to their employee health plan through Innovation Health, and then to their entire system. INOVA will use Babyscripts to engage women continually through their pregnancy and postpartum with digital tools, which will also reduce risk across the population. VN: What will you do with the new funding? Will it go toward hiring? Expansion? Product development? Please give me as much detail as possible. AS: Our focus with this new funding will be expansion and acquiring market share, bringing Babyscripts to more practices and particularly focusing on expanding into Medicaid. Specifically, we will continue to improve access to pregnancy care through remote monitoring, particular through building local population health deployments with large Managed Care Organizations. VN: Who are your competitors? What separates Babyscripts from them? AS: First, Consumer maternity apps; for example, What to Expect, BabyCenter and The Bump. These apps primarily share tips and tricks to pregnancy, in conjunction with a stream of endless ads. While this information is certainly useful, Babyscripts is the only platform that delivers educational information that aligns with a provider’s care plan: our solution connects the clinical provider and patients together using technology, while at the same time lowering the cost of care. By including the provider and all of their guidance, specific information, and advice into the equation; the patient is assured of getting information that aligns with her provider’s care plan, while keeping engagement high. Our solution is much more than a delivery system for educational materials: Babyscripts deploys internet-enabled medical devices that directly triage information like high blood pressure back to the physician automatically in their desired workflow, a solution that no other consumer app provides. Second, payer focused apps and programs for maternity, such as Wildflower Health and Ovia Pregnancy. Again, the connection to the provider is critical. While maternity programs deliver evidence-based content, only Babyscripts allows the provider to customize their content, delivering the exact information that they want the patient to see and eliminating confusion. Further, Babyscripts’ internet-enabled monitoring devices detect abnormal trends and then triage those data points directly to the provider’s office. With Babyscripts’ risk specific modules, a provider is able to deliver different clinical experiences to patients dependent on risk. Third, non-obstetric based clinical apps like Wellpass, Vivify Health and Conversa Health. 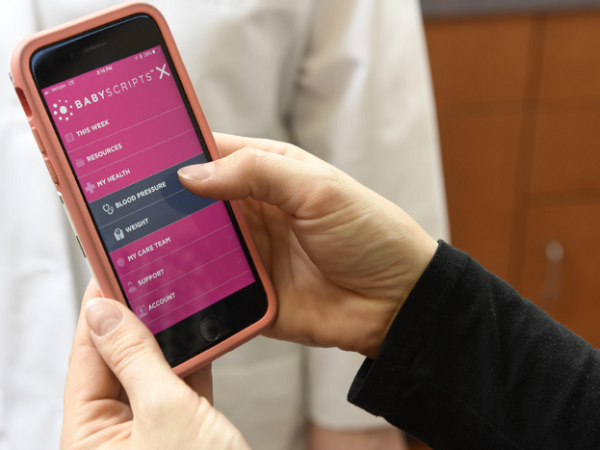 While there are other tools in the market that leverage mobile/digital tools in a clinical way, Babyscripts is the only clinical tool that is singularly focused on solving obstetrical problems. Many companies, even the EMRs, take a mile-wide, inch-deep approach with technology in clinical care, resulting in the development of a simple portal or interface. Babyscripts has narrowed their focus to pregnancy care, believing that a mile-deep approach is necessary to produce significant outcomes. As a consequence of this targeted approach, Babyscripts has one of the largest databases on weight, blood pressure, and symptomatic information, which can be leveraged to answer some of the most meaningful questions in pregnancy, like why patients get preeclampsia. No other company has the dataset to answer these kinds of questions. VN: How has the healthtech space evolved in recent years? How has that allowed Babyscripts to thrive? AS: The tech-enabled consumers of our current day expect the convenience of an app. Moms are no exception — they expect a tech solution/mobile app that gives them convenient access to information, and makes them feel personally supported by their care team. Babyscripts meets this desire for convenience, personalization, and support with a single data platform where women can be educated about their own health, with the security of continuous digital touchpoints with their provider and the convenience of remote monitoring devices. Challenges in the OBGYN space, including high maternal mortality rates, shortage of OBGYNs, etc., has forced the industry to look for new solutions to provide women accessible and quality care. Many women lack immediate access to care and don’t have the means or the time to travel the long distance to the closest provider. And this doesn’t apply simply to rural areas; in Washington DC, a city with a maternal death rate that is twice the already shockingly-high national average, the absence of care centers east of the Anacostia river, where 33 percent of the population is below the poverty line, is a huge problem. Faced with problems of distance, accessibility, and high socio-economic risk, many women forego prenatal care altogether. These problems have opened the door for healthtech: employing technology is an obvious step toward reshaping the way we measure and transform access. Technology, primarily in the form of digital health, is cheaper, more accessible, and more efficient. These solutions revolve around the opportunity to generate increased digital touchpoints and deliver appropriate risk stratification in a scalable fashion. The opportunity also facilitates remote support for education and counsel, all through the power of ubiquitous devices like smartphones, easing the burden on patients. Telehealth services can provide the security and comfort of an in-office visit without the inconvenience — and sometimes debilitating obstacle — of distance, while simultaneously facilitating interventions. The space is ripe for virtual care solutions like Babyscripts. VN: What is your ultimate goal with Babyscripts? Where do you want to see the company in the next 5 years? AS: In five years, we want to see Babyscripts in every pregnant woman’s household. We want to be working with every stakeholder that has a vested interest in pregnancy care — payers, providers, patients, social workers — so that there are no more maternal deaths. CB Insights is a private company database that provides real-time information on the world's most promising companies, their investors, their acquirers and the industries they compete in to help you invest smarter. Since launching in 2010, CB Insights has become the most trusted and loved source for private company information. Hundreds of clients (including New Enterprise Associates, Cisco, Salesforce, Castrol and Comcast) rely on CB Insights to help them answer the tough questions. If you like data, startups or quality analysis, join the other 110,000+ subscribers of our free newsletter. We received a grant from the National Science Foundation in 2010 and Series A investment from RSTP in 2015. We're hiring! Want to join a fast-moving, fun-loving group of data lovers? Head over to our jobs page.